Painted at the height of Ansdell’s career when he was a full Academician. This is a very confident sporting scene painted when Ansdell didn’t have to impress anyone – his pictures were the best he could produce and they just spoke for themselves. He had been a Royal Academician for eight/nine years by this time. The two figures represent a gamekeeper and his master, who probably commissioned the painting from Ansdell. He is bound to have a name, but I don’t think we will ever know who he was or where the scene was set. This kind of sporting composition was aimed at the market for the decoration of gentlemen’s studies or hallways, lobbies and gun rooms in their large country houses. For me, the delight of this painting is not in the subject matter but in the exquisite depiction of the corn stooks – sometimes painted in Pre-Raphaelite style interspersed with wild flowers - something that Ansdell returned to again and again; such a delicate handling must have taken years to perfect – so, having got the hang of it, why not use it as much as possible? This is a panorama set in a newly-harvested cornfield which would have seen rich pickings for the game shot as whatever wildlife was left in the field would take refuge in the shelter of the stooks and thus be easily flushed out. 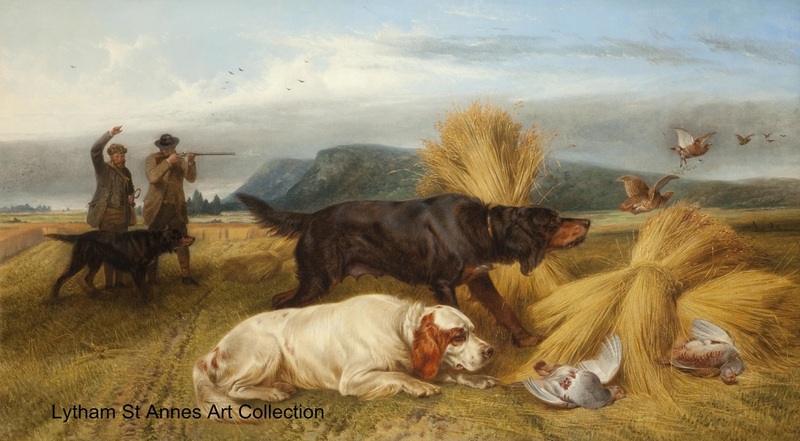 This time the dogs take centre stage – we see a black and tan Gordon Setter and right in the foreground a Clumber Spaniel in a rather laid-back pose with his head inches from a dead partridge! In all the years that I’ve owned dogs I have never come across such a relaxed approach by a dog confronted with game but I am told that a Clumber Spaniel is a quiet worker with a good nose and plenty of stamina, gentle of mouth and loyal in character. 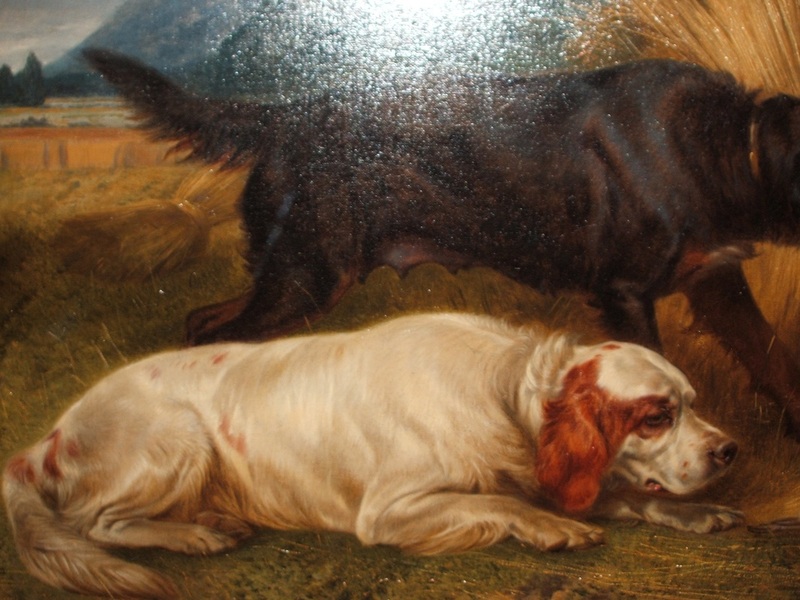 It was precisely for these qualities that Clumbers (which originated in 1844 from Clumber Park in Nottinghamshire – the Duke of Newcastle’s estate) became fashionable as hunting dogs – and specifically for pheasant and partridge. It was an artist’s responsibility to be up with the fashion of the day! The hunter in the background looks an uncannily good shot! The flying birds give almost a 3D effect, being skilfully graduated in size linking the foreground with the distance. I think there may be a church in the far distance on the other side – the landscape is as good as Ansdell gets with its lake, trees and escarpments.